We know where we are the minute we enter the theater at the Temple of Music and Art. With the beat of the blues reverberating, we have entered the world of Memphis Lee and his diner, a somewhat shabby restaurant sparsely populated by a handful of characters on a typical day in a doomed urban area. Designers Vicki Smith's set and Brian Jerome Peterson's sound place us there fully. 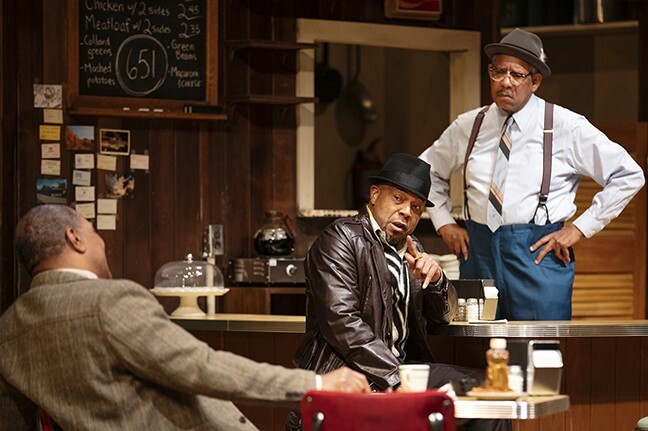 This is the world of August Wilson's Two Trains Running, and the time we are about to spend with these folks, although not full of high drama, is rich with the characters' stories and personalities as they negotiate their lives while cultural and social changes are looming over them. Playwright August Wilson set a lofty goal for himself when he decided to try to distill and illuminate the African-American experience throughout the 20th century in America. For each of its 10 decades, he created a play that mined the social and historical context of the lives of individuals trying to negotiate their way in difficult circumstances, which had been created within a larger context of hostile and racially polarized territory. Called The Pittsburgh Cycle, and also The Century Cycle, two of the 10 plays won Pulitzer Prizes. Arizona Theatre Company has produced a number of these plays. 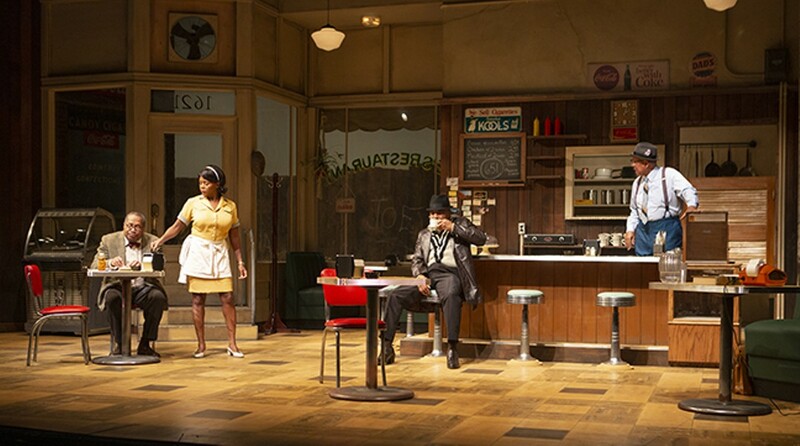 Two Trains Running is Wilson's slice of the 1960s, when changes for African-Americans, both political and cultural, were erupting after feelings had seethed and swelled for years. The play itself takes place in 1969 in The Hill District in Pittsburgh, where Wilson himself grew up. But these characters are not attached to these waves of change. ATC's is a good production, although it doesn't have the impact of their production of Fences a couple of years ago. Each of the plays is compelling, but they are quite different. This production, directed by Lou Bellamy (who also directed Fences), brings us honestly drawn characters whose intersecting lives deliver a heartfelt look at a crucial time and place. But the play is driven by the often passionate storytelling and memories the male characters reveal, not a plot's movement. It's fortunate, then, that one of the things that Wilson does so well is give us real people trying to negotiate their own lives, not their place in history. They are not the movers and shakers; they are the players, the pawns. This is one of the things that make Wilson's plays so strong. He gives us real people, not representatives. Although we see them in the context of time and history, it's the individuals we see and feel for. Wilson's plays are far from history lessons. Risa (Erika LaVonn) is the lone waitress, a silent sphinx as she shuffles ever so slowly across the room, her legs with visible scars where she cut herself to make herself undesirable to men. She does her job but controls the pace and tone of her responses to customers and her boss. Inscrutable and self-determining as much as she is allowed, hers is the only feminine presence in the diner, a men's territory. Into this small group comes Sterling (Cedric Mays), with a cocksure strut, a former resident of the neighborhood just released from the penitentiary where he had been sentenced for robbing a bank. He's hoping for some friendly faces who can point him in the direction of finding work, but there's not much to be had. We also meet West (Dennis W. Spears), the undertaker and the richest man around, who currently has in his charge Prophet Samuel, who has attracted a huge crowd for his viewing. West offers Memphis $15,000 for his building, in the hopes of selling it back to the city for more. But Memphis declines. There is the lack of interest and even scorn for what is happening currently in their world, with its talk of Black Power and rallies to honor Malcolm X. Those things have little to do with them and their lives. As Memphis says, "Niggers killed Malcolm. Niggers killed Malcolm...These niggers around here talking about black is beautiful. Sound like they trying to convince themselves. You got to think you ugly to run around shouting you beautiful." Only younger Sterling shows some interest in what this might mean for them, but laments that if he can't find a job, he's going to have to find a gun. There is hardly a plot; there is a lot of talk. These characters certainly create a rich tapestry, its texture woven with their stories of struggles with women, with white men and jobs, with the law. But there is a languid sense of movement that makes the three hours run time feel its length. While most of Wilson's characters are grounded and realistic, he almost always includes one who is more symbolic or who has an almost oracular function. Here this is Hambone (Ahanti Young), whose years-long attempt to collect what's due him from a white businessman—a ham in exchange for painting a fence—has weighed his mental or emotional capacity to a breaking point. He has become a street person who wanders daily, beating his breast and demanding his ham. He is fatally wounded by promises broken, a fitting and disturbing image of black and white America. There are great riches in this production as Wilson's vision unfolds in the capable hands of this cast. It may stumble a bit, but it's definitely a story worthy of being told and heard.